Greyhounds finish their racing careers at an early age and love to go to good homes where they can live out the rest of their lives with a loving family. The Retired Greyhound Trust is the only UK charity dedicated to finding homes for ex-racing greyhounds. Founded over 30 years ago, the charitys 70 branches cover the length and breadth of the country. Volunteers work all year round to find the perfect home for retired greyhounds in their local area – they are so committed to finding the perfect match for the owner and greyhound, they even ‘cat test’ dogs to make sure they fit it in with current pet arrangements. Almost 40,000 greyhounds have been adopted successfully through the charity by all sorts of people, including families and senior citizens. The RGT is committed to promoting greyhounds as pets. The breed is often overlooked because of common misconceptions. People often see greyhounds as racing machines and sometimes consider them to be aggressive. Ivor Stocker, director of the RGT says: ‘Greyhounds are a gentle, affectionate and fun-loving breed that adapt easily to family life. While they certainly enjoy exercise, greyhounds require less than many people would expect, staying happy and healthy with just two short walks each day. Greyhounds are low-maintenance companions who rarely bark and require little grooming. In the meantime, to find out more about adopting a retired greyhound or becoming volunteer at your local RGT branch visit www.retiredgreyhounds.co.uk or call the charity’s headquarters on 0844 826 8424. When Bobby and Barbra first met at the RGT kennels it was love at first sight for these four-legged friends. After only a few months together the handsome couple have become inseparable and are now in need of a new home together. 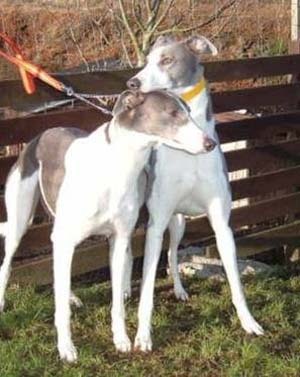 Both blue and white greyhounds, Bobby and Barbra make a striking pair. While four year old Bobby could be described as a gentle giant, his best friend, five year old Barbra, is rather more petite and delicate. They would both make excellent pets. 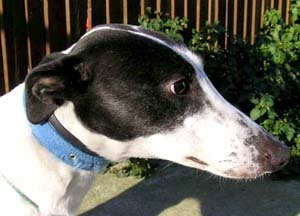 Retired greyhound Elvis is ‘lonesome tonight’ and looking for a loving home. Through no fault of his own, Elvis found himself back in the care of the RGT after his former owner was no longer able to care for him. Elvis, a striking blue brindle greyhound, is very loving, loyal and gentle and enjoys nothing better than spending time with people. At nearly 8 years old Elvis is a ‘middle-aged’ greyhound but he is still very fit and loves his walks.